Available to Order. Estimated delivery is 14/06/2019. 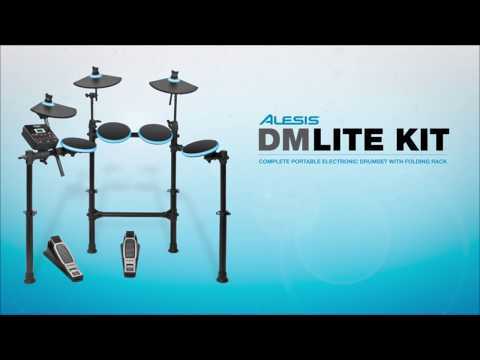 The Alesis DM Lite Drum Kit is a dynamic and fun kit that has been designed with the needs of both beginning drummers and seasoned drummers in mind. The kit features 4 LED drum pads and 3 LED cymbals that illuminate when struck, providing a quick visual reference whilst playing. The pads and cymbals are designed to be as quiet as possible - making them very neighbour friendly! The kit also features a low-noise, dynamic Piezo kick drum pedal trigger. The onboard drum module features a variety of premium sounds, as well as “Learning Mode” and “Play Along” functions which can make practice a lot more fun and motivational for newer players. The “Learning Mode” function is geared towards improving playing technique and timing skills, by allowing drummers to follow patterns on the illuminated cymbals which helps you develop your technique visually. The “Play Along” function provides fun pre-loaded tracks to jam along with that can be entertaining for new and experienced players alike. To make things much simpler, the entire kit comes fully assembled on a height-adjustable, foldable 4-post rack. You need not worry about having to accommodate a fully setup kit if you are struggling for space as it can be tucked away discreetly following use. Better still, it can be folded down without needing to connect and disconnect any cables or remove any pads. To ensure that you can get playing straight away the DM Lite also comes with a pair of included drum sticks. For a well built, compact and affordable drum kit that is not only fun to play but can also improve playing skills and technique, the Alesis DM Lite Drum Kit is the perfect choice. Posted on 25/03/2017 by Vicula My partner bought me this as a gift 6 months ago and it proved perfect for learning basic rhythms on; now 2 months with a tutor and starting my Rock School exams in earnest, I'm going to sell it on and upgrade to a considerably more advanced kit with mesh heads and compatibility with 'proper' pedals etc. I've had a couple of problems with it, clunky pedals that don't feel at all like the real thing and the audio on the ride symbol often 'sticks' and has to be disconnected from the pad to reset it so to speak; but in defense of it, I did go straight in with rock/ metal beats and heavy sticks so don't let this put you off as it clearly wasn't designed for this. If you're on a tight budget, not interested in pursuing serious tuition and/ or want to test the drumming waters so to speak it's a perfect starting block, especially for kids. Posted on 22/09/2015 by Samuel I liked the illuminating drum pads and the sound quality was amazing. As an 11 year old beginner, this suited my every need to play the drums. Posted on 30/06/2015 by Nic The most amazing drum kit ever. And as a beginner it's amazing sound quality and so easy to learn. I love that you can put your headphones in and not annoy any one in the house. Best value ever!!!!!!!! Posted on 29/10/2013 by Lauren I went into Huddersfield today and had a good play on this drum kit. Its very practical for size, and for £199 that's the cheapest you'd probably get. The kit had lots of great sounds per drum type. This drum kit is great for beginners. Great value for money! Posted on 22/10/2013 by Norman I had a good play in your Huddersfield store on Friday. Not to blow my own trumpet but as a semi-pro this isn't for me. I can however, see the benefits this will bring to people of beginner level. Kids can learn without bothering the folks (problem I always had!) And for £200 lets face it, you wont get anything better for that price. Posted on 22/10/2013 by Mark Got this for my lad to start learing on, I barely see him now! Glad its an electric one though. Headphones on and he's away. Really reccomend as a father to others out there that have kids that want to learn drums.